Northern Manufacturing & Electronics, following last year’s success, continues as the largest exhibition in the North next month, immersing visitors in technologies gathered from across the nation in one congregation at Manchester’s Event City. With the aim of supporting local businesses and generating quality leads through a comprehensive display of precision engineering products. Alongside a promising selection of industry pioneers that, through new innovations, can revolutionise your manufacturing processes, guaranteeing to increase productivity and improve your profit margin. At the show, OGP UK will showcase advanced multi-sensor technology with the SmartScope CNC 200 multi-sensor measurement system. 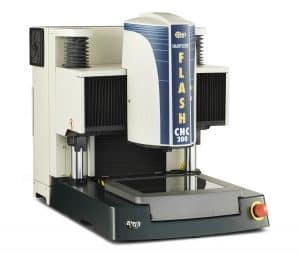 Featuring a (through-the-lens) TTL Laser and Touch Probe sensor to demonstrate the CNC’s metrological capabilities and speed using a selection of both metal and plastic components through laser scanning and optical measurement. There will also be the first demonstration of the new ZONE3 software which enhances your SmartScope system’s data management capabilities as well as allowing users to acquire faster measurements with ease of use. As our most comprehensive software, ZONE3 puts the power of OGP’s industry-wide experience to the ultimate use in the most effective measurement software yet. As the pioneer of CMM technology, OGP were the first to develop a video measuring machine (VMM) using video technology in measuring components repetitively, accurately and efficiently. Our team at OGP UK have continued to deliver the most sophisticated, reliable, precise and fast metrology platforms available across a wide range of industries. If you’re involved in Automotive, Aerospace, Defence, Electrical or Electronic Engineering, Handling, Industrial Machinery, Mechanical Engineering and Metal Processing sectors, the exhibition gives you an unrivalled opportunity to see the very latest advanced manufacturing technology and production techniques available for your business. You’ll be able to witness live displays of innovative industrial products, design engineering solutions and interactive demonstrations of OGP’s most advanced multi-sensor technology on stand C32. Don’t be afraid to challenge us, bring along one of your parts to the event and OGP will demonstrate how easy it is to measure components on one of the machines. Don’t miss out on the chance to witness OGP’s advanced multi-sensor metrology capabilities, you will quickly learn how our machines can improve your productivity.